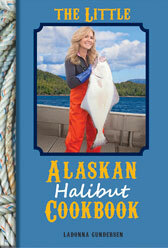 The Little Alaskan Halibut Cookbook by LaDonna Gundersen Hitting Shelves Soon! Ketchikan, Alaska – April 27, 2017 – Alaska fisherwoman and author LaDonna Gundersen’s latest book ​The Little Alaskan Halibut Cookbook will be available May 6, 2017. “The promise I try and keep with my recipes are simple, no fancy equipment or hard-to-find ingredients,” said LaDonna Gundersen. “I take pride in the fact, that anyone can make them, whether you’re a five-star chef or a first timer. All are a delicious addition to a cook’s repertoire of recipes.” In the book, you’ll find classic and simple suppers including Halibut and Chips, Bacon-Wrapped Halibut, and Roasted Halibut Cheeks in Lemon Butter Sauce. On the grill dishes like Barbecued Halibut with Sundried Tomato-Basil Pesto, Grilled Haliburgers, and Grilled Halibut with Fresh Strawberry Salsa. Hearty main courses that you’ll want to serve at dinner parties like Halibut and Brie in a Puff Pastry, Halibut Enchiladas, and Halibut with Coconut-Curry and Bok Choy. And, a handful of tempting sweets like Apple Crumb Bars, French Coconut Pie, and Heavenly Key Lime Pie. Recent accolades include a Master Chef Class at the National Hospitality Institute in Muscat, Oman, as well as a Fisherman to Fisherman Cultural Exchange. In December 2016, ​Edible Alaska Magazine ​featured the Dungeness Crab and Corn Chowder recipe, and in March 2017, the Alaska Seafood Marketing Institute #eatalaska campaign featured the Fresh Rolls with Smoked Salmon and Basil recipe. There’s still time in the season to make this yummy meal using local ingredients! Check out this episode of Celebrity Chef with LaDonna and Cameo McRoberts on KPU TV 611. What to do, what to do….Hit up THE ASYLUM on Mondays for yummy treats. Here’s a sneak peek from LaDonna’s recent visit where Jimmy D served up some totally rockin salmon! You can watch the whole show on KPU TV 611. With the cuteness of Caitybug and tasty cookies, you can’t go wrong in the Test Kitchen! Watch this show, and all our other award-winning local TV only on KPU TV 611. Recipe featured in Edible Alaska Magazine. So excited for our Dungeness Crab and Corn Chowder recipe to be featured in Edible Alaska Magazine. Comments Off on Recipe featured in Edible Alaska Magazine.